People snore because of vibration of tissues in the back of the throat that occurs during sleep. In order to prevent snoring the airspace has to be widened. Experts have been using this treatment for more than 2 decades to cure around 90% of their patients' snoring problems. Snore Defense employs the same method because of its proven effectiveness. Snore Defense is designed in a way that guarantees immediate effect. You can use it as soon as you open the box but without the expensive procedures with your physician. 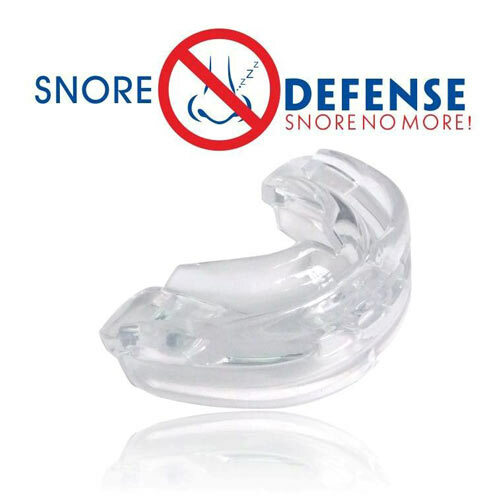 Snore Defense is cleared by the FDA, so you don't need to worry about its quality as it is safe and efficient. We assure you that you will be pleased with how Snore Defense works. This is why if you order it now we won't charge you for the shipping taxes! Snore Defense works quickly and effectively. Snore Defense is really effective! Many of you have been disappointed by products that do not deliver the promised results . You have probably tried breathing strips, pillows and chinstraps to get rid of the snoring. Most of those methods are ineffective because they don't tackle the problem in the right way- they ignore the fact that snoring occurs in the back of the throat. 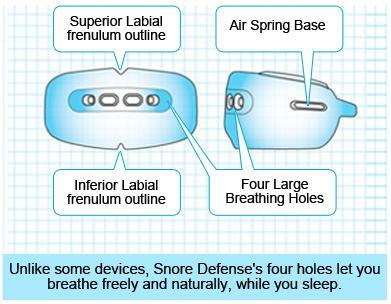 The secret behind Snore Defense's effectiveness is that it gently lifts the lower jaw through its innovative approach. As a result the airspace in the back of the throat is widened. As the vibration of the surrounding soft tissues is eliminated. This is how the problem with loud snoring is solved. Snore Defense's Air Spring Base Technology is innovative because it allows variable bite opening and gentle temporomandibular joint decompression. Snore Defense does not make you feel uncomfortable as many other mouthpieces on the market do. Discomfort comes if your jaw is in a clenched position, with Snore Defense this is not the case. All in all, the function of the device is to enable you to get a good night's sleep. It is important to make sure your jaw is completely relaxed while using the device. In this way you will be able to feel comfortable during sleep. When you use Snore Defense there is no preparation, no set-up and no lenghty molding process. You simply open the package, place it in your mouth and go to bed. The idea is to enable you and your loved one to get a good rest during the night - easily and effectively.